Yes, you can cancel an order if it has not entered the billing process. If you have not received an invoice, we can cancel the order at no charge. If you received an invoice (meaning the transaction was completed), we will charge a $30 restocking fee. For more information, refer to our Cancellation & Return section. Why don’t you have my vehicle listed in your selectors? If your vehicle does not appear in our list, please contact us. One of our experts will be able to tell you if you can select a previous version of your vehicle or a similar model to shop with our usual fitment guarantee. If that is impossible, we will use the manufacturer's informations to help you find products that fit your vehicle. Do you stock everything that is listed on your website? Since we offer a very large number of products, it is impossible for us to stock everything at our facility. That is why we work closely with various suppliers everywhere in Canada and the USA to provide you with a great selection of tires and wheels. As our suppliers’ stock often changes - especially during peak periods - some products can be out of stock or require a special order (longer delivery time and/or additional fees) even if they appear to be available on our website at a specific price. Our goal is to offer a wide variety of tires and wheels and to be the link between the manufacturers and you, our valued customer. We are doing our very best to keep our website updated on inventory and prices, yet sometimes there can be a delay. Does PMCtire offer free shipping? If not, what will the charges be? Yes! We ship everywhere in Canada at the lowest price possible. Shipping is free in most major cities across the country for orders of two (2) tires or wheels and more. To verify if shipping to your location is free or at very lost cost, start by adding items to your cart. Then, go to your cart, enter the province and postal code of the delivery location and click on the “Estimate” button. If the shipping is not free, you will be able to choose the shipping company that offers the best price. Can you ship my order somewhere other than my billing address? Yes, your order can be shipped to a different address, whether it’s at your workplace, at one of our affiliated installer, or at your favorite garage. To do so, when checking out, simply enter the desired delivery address. Please note that a signature will be required upon delivery. However, you can pre authorize the shipping company to drop your package to a designated place, without a signature. If you do so, you accept full responsibility in the event of theft, vandalism, etc. When checking out, simply answer “Yes” to the following question: “I authorize the carrier to leave my packages at my home in my absence.” and indicate where you want your package to be dropped in the “Delivery Instructions” box. Please note that according to its work convention, the driver will not cross fences, open doors, or call you before, during of after the delivery. If you refuse the delivery without signature and there is nobody is present to sign, the shipping company will try again the next day. After 3 tries, if you did not contact them to make an agreement or an appointment, the products will be brought back to their warehouse and you will have to go there to pick them up. We ship our products through the best shipping companies. These companies are not involved as long as you have not received an email with a tracking number for your package. However, from the moment you receive a tracking number, the order is in their hands. Should there be a delivery delay, you will have to refer to shipping company. In the email you received, you will find the shipping company’s phone number and a tracking number to find out where your package is. If you have any questions about a late delivery, please contact the shipping company directly. Why did I not receive a tracking number after I place an order? Before we can issue a tracking number, we have to proceed to a number of verifications regarding the products you have selected, their availability and fit on your vehicle. After you have placed an order, you will receive a confirmation email. After we have completed our verifications, we will proceed to the transaction and send you a second email with your invoice. We will send you a third email with your tracking number usually 24 to 72 hours after we have received your order. Since we purchase stock from various suppliers, some items may arrive at our facility before others be ready to be shipped out at different times. That it why you might receive parts of your order separately. Are your price lower than elsewhere? Buying in large quantities allows to get great prices from our suppliers. Moreover, we are always trying to help you save money by negotiating on a regular base. With free shipping and Free Mounting and Balancing with most sets of 4 tires and wheels and almost everywhere in Canada, there is no doubt our prices are among the lowest on the market! Our mission is to offer great prices and great advice! Our experts guarantee that the products you buy on our website will fit on your vehicle. You will be delighted with our prices and your overall purchase experience! In the event of a positive answer, we will contact you to proceed to the remaining steps of the purchase. *PMCtire reserves the right to decline any price match request. Why was my credit card charged before my order is shipped? To ensure that the funds are available on your credit card when the order is placed, we obtain a preapproval of the amount of your purchase. This way, if needed (and with your consent), we can modify your order without issuing a refund or re asking that you provide your credit information. After the order is processed, your credit card is charged and you receive a second email with your invoice. After you place the order, our experts proceed to a number of verifications regarding the products, their availability and fit on your vehicle. Therefore, it is possible that even after your order is confirmed and a preapproval goes through on your credit card, you receive an email or phone call from us saying that the items you selected are not in stock. If you wish to cancel your order, we simply void the preapproval; if not, we edit the order with the updated items and charge you accordingly. We accept most credit cards (Visa, Mastercard, American Express, JCB) and also Visa Debit and Debit Mastercard. Are there any ongoing mail-in rebates? On our Mail-In Rebates page, you find can every manufacturer's ongoing mail-in rebates. The products eligible for a mail-in rebate are identified with an icon, allowing you to find them easily. Purchases made online do not qualify for every manufacturers' mail-in rebates. We do not tag those as offering mail-in rebates on our website. How can I claim my mail-in rebate? First, you will have to fill out a form (printable or online) with your personal information (name, mailing address, etc.) and details about your tire purchase. When you'll be asked the dealer's name, write PMCtire inc. (not pmctire.com). A copy of your original invoice will also be required. If you fill out the online form, you'll need to upload your invoice (PDF). Carefully fill out every field to make sure your request is eligible. A mistake the information you provide could result in a rejected claim. Most of the time, marketing firms are hired by manufacturers to process applications. Note that only the tire manufacturer and the marketing firm can decide whether the mail-in rebate application is qualified. PMCtire is in no way responsible in regards to your mail-in rebates. For a more efficient communication with the manufacturer, we suggest you claim your rebate online. It will be easier to track the status of your claim or to provide the manufacturer with missing information if the need be. Depending on the season, you should allow from 6 to 12 weeks for your request to be processed. In what form will I receive my mail-in rebate? Some manufacturers offer prepaid credit cards redeemable in any shops. Other manufacturers send out checks. In all cases, you will never receive a rebate on your next tire purchase. The amount will be fully spendable at your discretion. How do I know if my mail-in rebate request was processed? Most of the manufacturers that have an online mail-in rebate form provide a tracking tool. The online form and the tracking tool are located on the tire manufacturer's website. Why do I need to wait for PMCtire's 2nd email to claim my mail-in rebate? Manufacturers require a copy of your original invoice as purchase proof. Screenshot of an online order and order/shipment confirmation emails are not accepted. Your invoice will be sent out only after your credit card is charged, attached to the second email we send you (the first being a confirmation of your order). How do I know if the tires I choose will fit my vehicle? We guarantee that the tires you buy on our website will fit on your vehicle! However, it is important that you select your vehicle even if you know the dimension of your tires. If you own a used vehicle, your current tires do not necessarily respect the original tires dimensions. When shopping on our website, use our “Search by Vehicle” tool to ensure that you find products that fit your vehicle specifications. For more information on our Fitment Guarantee, click here. Will my tires and wheels be mounted and balanced before shipping? Our professionals will be happy to mount and balance your tires and wheels if you select the option. Thereafter, your set will be carefully packed ready to get shipped. All you need to do is install the wheels on your vehicle. What should I do if I receive a defective tire? First of all, it depends if the tire is covered by a warranty: not all the manufacturers offer a warranty on their products. First, we will need your help. You will have to provide clear pictures, a detailed description of the issue, a rotation proof, the installation date and the number of kilometers driven with the tires for us to send to the manufacturer. The more information we have, the more chances we have that the manufacturer accepts your request. Once we have all of these informations, we will build a case. There is a 95% chance that we are able to resolve the issue before we involve the manufacturer by referring to our bible. That bible explains the damages that can occur, their causes and the procedures that must be followed. Here is a sample. If, after analysis, you still believe that the tire is defective (not damaged due to road hazard), we will take it back to our facility at our own expense. 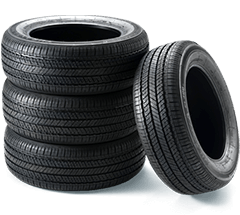 * If you need replacement tires, we will create a new order, billed separately, and ship it. The manufacturer confirms that the tire is indeed defective and we refund you for the amount paid for the replacement tire. The tire is not considered defective, but damaged. Unfortunately, we do not issue a refund for the replacement tire and shipping fees apply. You can return unused, unmounted tires purchased on our website within 30 days following the reception date. Some restrictions and fees may apply. For more details on our return policy, please visit our Cancellation & Return section. How can I set-up a staggered kit on your website? As of now, our vehicle selection tool shows the original tires’ FRONT and BACK dimensions. The easiest option is to do two searches (one for each dimension) and to buy in pairs. Even simpler, you can call us at 1 888 640‑7638 and we will be happy to help you make your selection. We apologize for any inconvenience, our team of programmers is currently working on a solution to offer this research feature. Is all the hardware I need to install my new wheels included? If you need any hardware to install your new wheels on your vehicle (whether it’s a centering ring, a key or nuts) it will be shipped with your order in a separate box. When you receive your new wheels, you will be ready for the installation! What if the wheels I purchased do not fit my vehicle? As stated in our Cancellation & Return section, once a tire is mounted on a wheel, it cannot be returned or refunded (mounting damages the tire). Depending on the circumstances and the reasons why the tires do not fit your vehicle, different outcomes may be possible. Each order is systematically verified by one of our experts as soon as it is placed. This step’s purpose is to make sure that the products are available, but also to confirm that they are compatible with the selected vehicle. Our website was built to facilitate your buying process: if you use our “Search by Vehicle” tool, the products that will show will be compatible with the selected vehicle. Of course, as nothing is perfect, there could be errors in our databases. 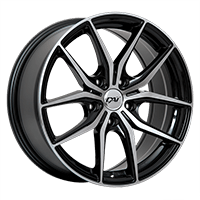 We suggest wheels that are available and compatible with your vehicle (using informations provided by the manufacturer) and modify your order. You decide to keep the wheels you have selected despite our recommendations. The order becomes a final sale and will not be refundable. We proceed to a compatibility test, meaning we share the risks: we ship a single wheel, no tire mounted. When you receive it, you remove a wheel from your vehicle (ideally in the front), and you put the new wheel on. You try to turn it to determine if the brakes are cleared, if the wheel does not rub on the suspension, on the wings, etc. If everything works, we send you the other three wheels. If you have tires in the order, we send you the other three wheels mounted and balanced. As for the fourth wheel (the one you already have), you can either send it back for us to do the mounting and balancing, or you can do it at your garage and we will credit you. If the wheel does not fit on your vehicle, you will have to return it on your own expense. The shipment fees can vary according to your location and the weight of the item. You place an order, everything goes well and you do not receive a call from us. Regardless, you make sure that the wheel fits on your vehicle before you mount the tire as specified on the stickers on our delivery boxes. You place an order, everything goes well and you do not receive a call from us. If you’ve had your tires mounted and balanced by us (ready for the installation on your vehicle) and your wheels do not fit, we will take back your wheels and tires with no charge and find a replacement product that will fit your vehicle. For more details, please visit our Cancellation and Return section. Is there a warranty on the wheels' finish or their quality? We strongly suggest that you verify your wheels upon delivery. In the event of a damaged or defective wheel, it will be easier to prove that it is not due to road hazard. First, we will need your help. You will have to provide clear pictures, a detailed description of the issue, a rotation proof, the installation date and the number of kilometers driven with the wheels for us to send to the manufacturer. The more information we have, the more chances we have that the manufacturer accepts your request. If, after analysis, you still believe that the wheel is defective (not damaged due to road hazard), we will take it back to our facility at our own expense. *If you need replacement tires, we will create a new order, billed separately, and ship it. The manufacturer confirms that the wheel is indeed defective and we refund you for the amount paid for the replacement tire. The wheel is not considered defective, but damaged. Unfortunately, we do not issue a refund for the replacement wheel and shipping fees apply. Do you use original TPMS? At PMCtire, we use ITM universal TPMS, which require an installation tool called OBD II. We make sure that when ordering a set of wheels and tires with TPMS (or wheels and TPMS), the sensors are programmed to your vehicle before shipping them out. The only step left is to get the sensors synchronized with your car. How do I synchronize my new TPMS sensors? Every car does not have the same relearning process for TPMS codes. Some cars do that recognition by themselves by driving a few kilometers, whereas others, such as Toyota, Lexus or Honda for example, require the OBD II installation tool. When buying universal TPMS, it is important to go to a garage that is working with the proper tools to make the connection possible. Most dealers and garages are not equipped with the OBD II installation tool to deal with aftermarket TPMS; this is why a lot of people are told that they have the wrong TPMS, or that it is defective, when in fact the tool used does not recognize the codes.